BEIJING/SHANGHAI (Reuters) - A major explosion at a chemical plant in southwestern China has killed 19 people and injured 12, authorities said on Friday, the latest deadly industrial incident in the world's largest producer of chemicals. 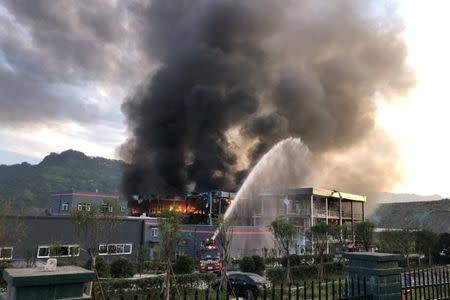 The cause of Thursday evening's blast at Yibin Hengda Technology in an industrial park several hours southeast of Chengdu, the capital of the southwestern province of Sichuan, is not yet known, the local government in Jiang'an county said. "I heard seven explosions in ten minutes," an eyewitness told domestic news agency Beijing News. "It took a couple dozen firefighter trucks to put out the fire." "I heard a big explosion, it was really loud and I felt the ground shaking," Liu Ping, a manager from the industrial park told China Newsweek, who was in his office at the time of the eruption. "My first response was that something was wrong and I went the window and saw thick smoke rising from the east."